Killamarsh Secondary School Teachers and Staff. Can you give the year. See note below. (Photo courtesy of David Nicholls). 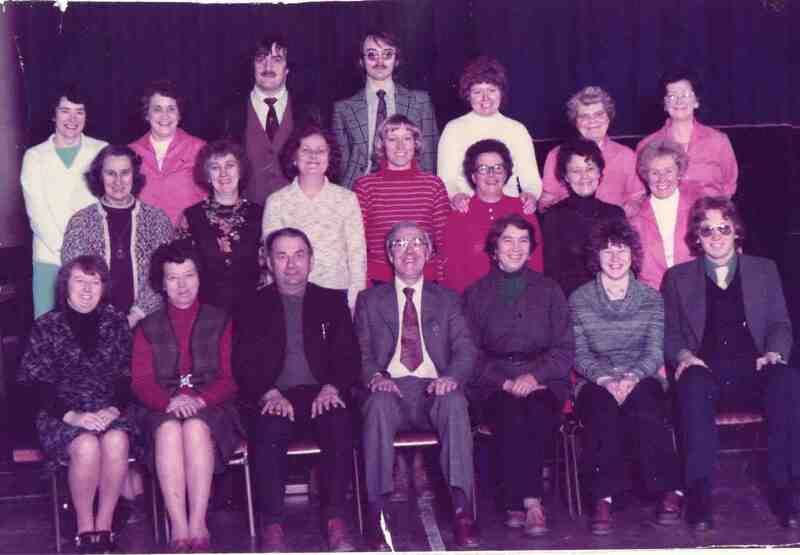 Top middle Mr Chambers,second row,left Mrs Beech and Mrs Davison.Bottom row from left ,second person on is Mrs Whitfield,Mr Large then the Headmaster Mr Howdell. next to mr chin (chinny) is Ralph Chambers . and is that mr Fretwell font row far right ?? i would have just started at this school , either this year or the year after . Middle row 1st left is Mrs Beech. Back row: ?, ?, David Chin, ?, Norma ? (nee Sage), Rhoda Rear, Barbara Heeley. Middle row: ?, ?, ?, Mrs Greenwood, Edith Gascoigne, ?, ?. Front row: Mrs Hicks, Mrs Whitfield, Mr Large, Mr Howdel, Mrs Burton, Mrs Vernon.